Hi, it’s Natalie from Doodlecraft! 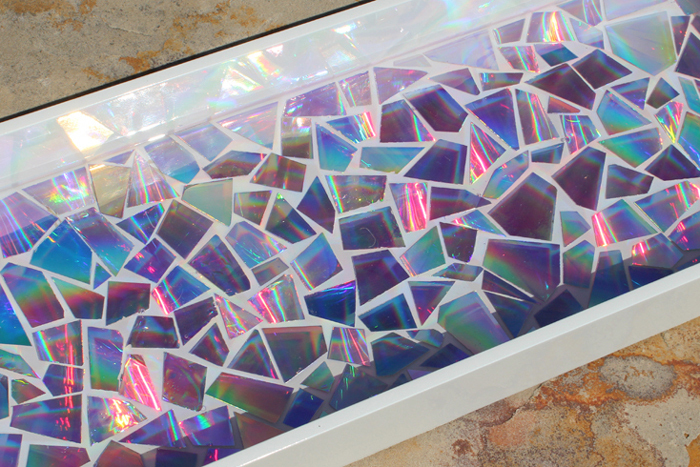 Isn’t this mosaic tray incredible? 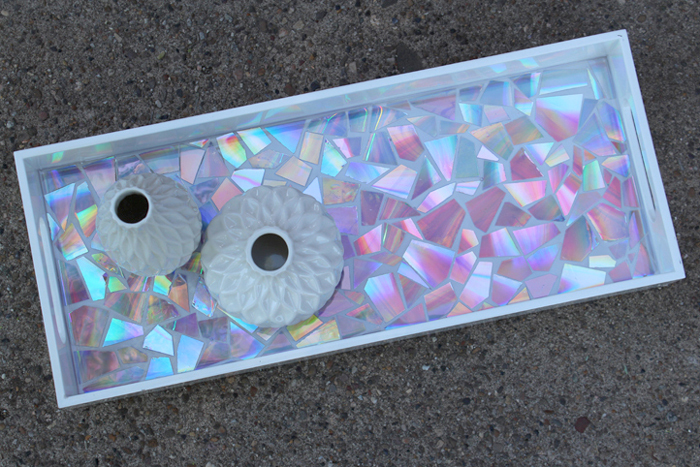 It’s so shiny and sparkly! Best part is that it’s a recycled craft! Do you have some old DVD’s laying around…like the ones that you burn yourself? Maybe you backed up your computer years ago and haven’t tossed the old discs yet. I bet CD’s would work too! 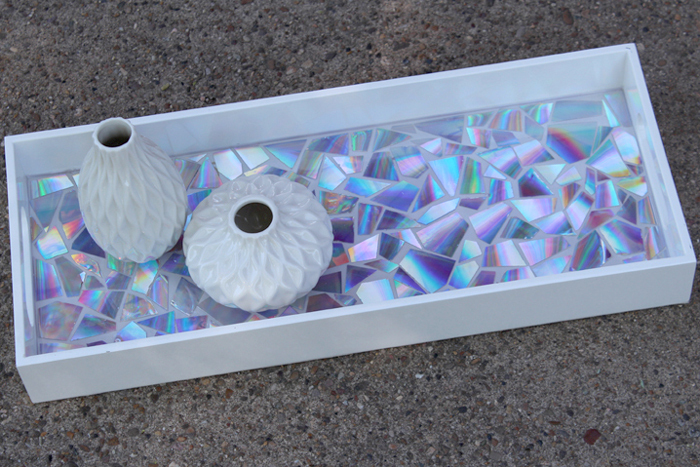 Get them out and make a gorgeous mosaic tray for the entry table. 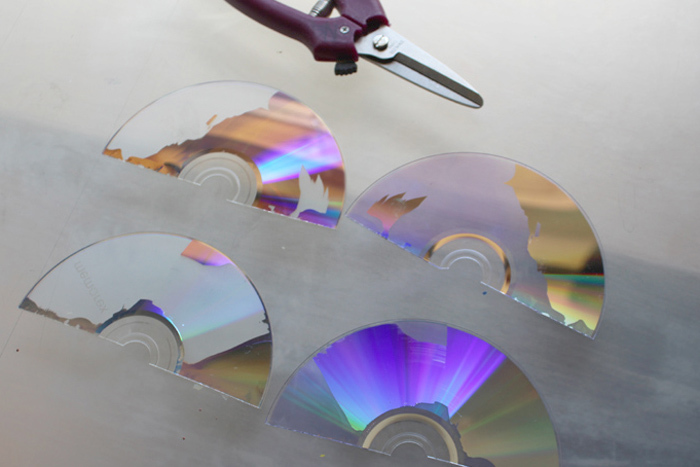 Start by cutting your DVD’s in half with some strong scissors or clippers. 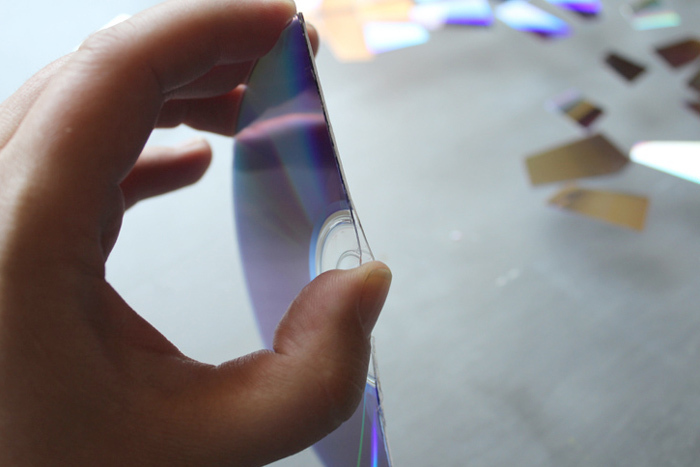 DVD’s have 2 layers with the metallic foil in between the layers. Gently pry them apart with your fingers. 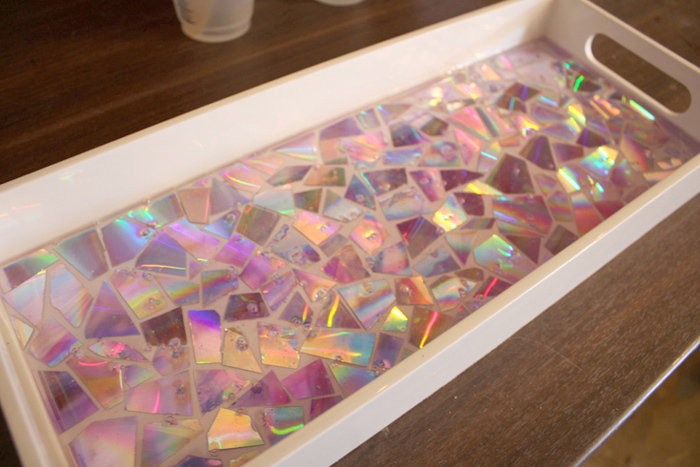 Then cut the halves so they are in little tile pieces of different shapes and sizes with the shiny rainbow metallic side up. Try not to touch the shiny metallic surface as it will leave finger prints. 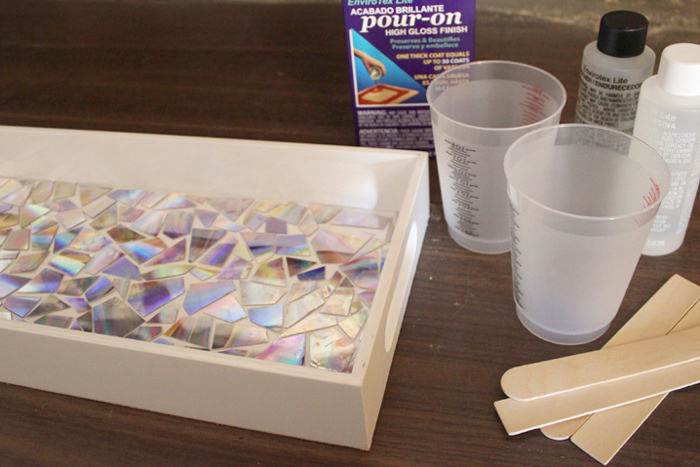 Then hot glue each piece on the inside of the tray. Cut pieces to fill spaces. Fit them in like a mosaic tile craft. It takes a lot more DVD’s than you think it will take. I had my kids guess how many disks I used and they guessed 3. I used 9 for my 18 by 8″ tray. 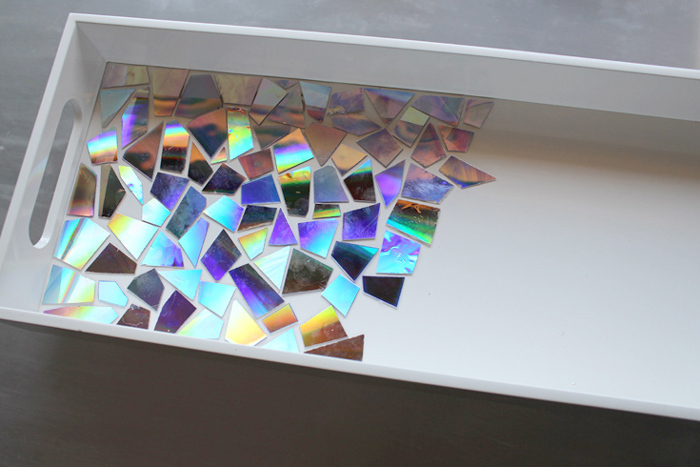 The empty spaces between the mosaic tiles look like grout, so try to keep a uniform spacing around all the little “tiles”. Now, I head out to the garage, but go somewhere that will be undisturbed for 24 hours. You will need the EnviroTex Lite High Gloss Finish. I used 8 oz. Read the directions carefully and follow it exactly. This is a one to one ratio. It needs to be mixed in one cup for 2 minutes and then poured into a second cup with a different stirring stick and then mixed for another minute. 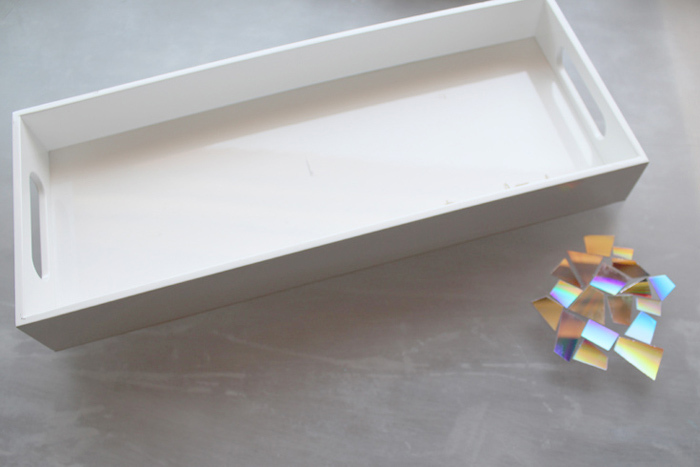 Then pour the high gloss in the tray. 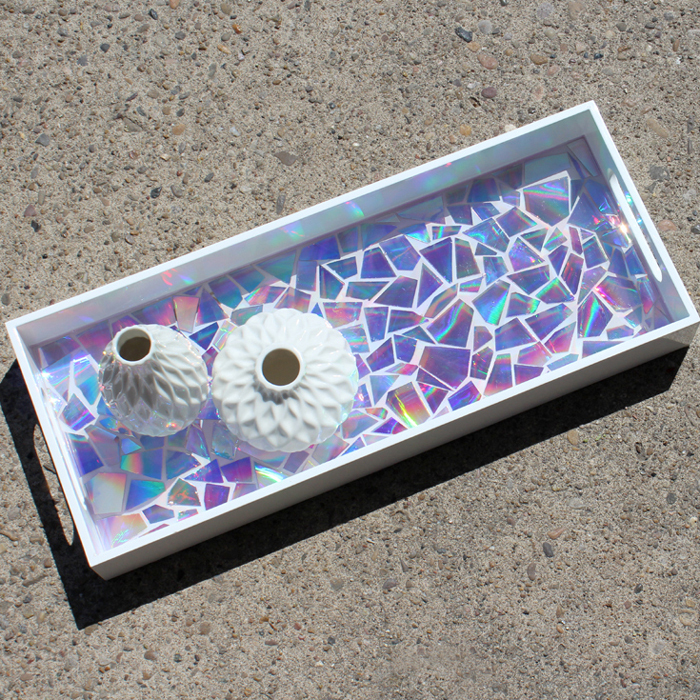 Gently move the tray around so the resin fills the base of the tray all the way to the corners. Instantly there are bubbles forming. Cover with a board and wait 20 minutes. Then use a heat gun on low heat and gently blow over the tray, it will instantly pop the bubbles. 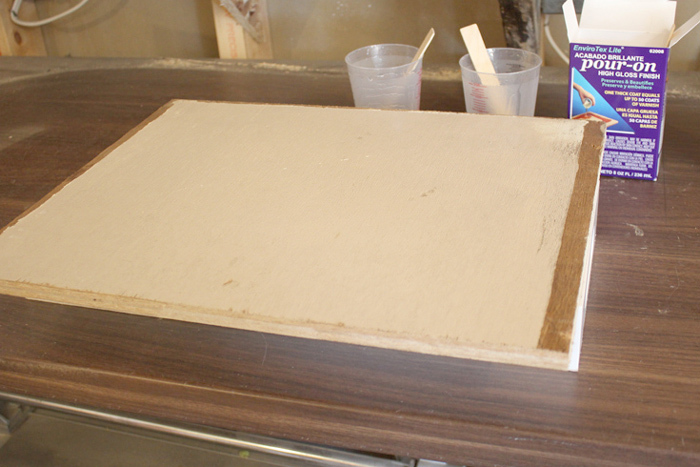 Cover with the board again to prevent dust from settling on the surface of the resin. Then wait 24 hours. This is the hard part. 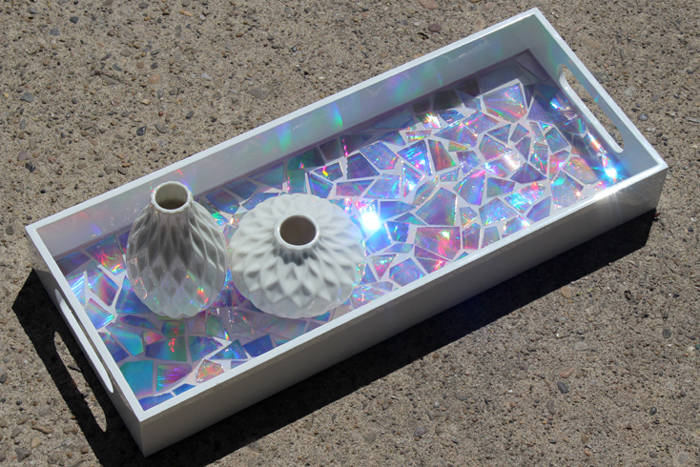 This mosaic tray has about a 1/4″ thick glossy resin coating all the tile pieces. Nothing but a smooth, wonderful texture–and so shiny! Be careful walking outside with this blinding piece! I love the range of rainbow colors it shows. By just moving slightly the colors change. Isn’t it just the best? I love it. 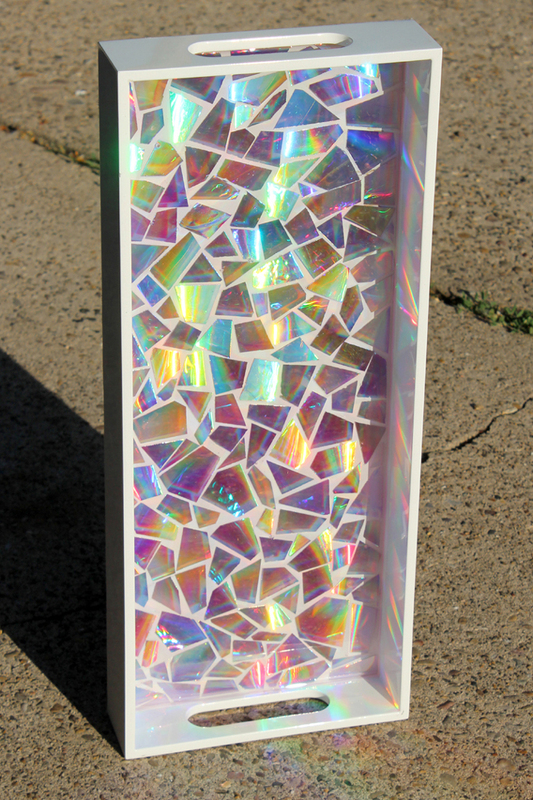 I find myself wondering what else I can turn into a DVD mosaic! This is a great project I am going to try! Thanks for sharing. I was not wondering what you think about these uses??? If not… What do You think??? 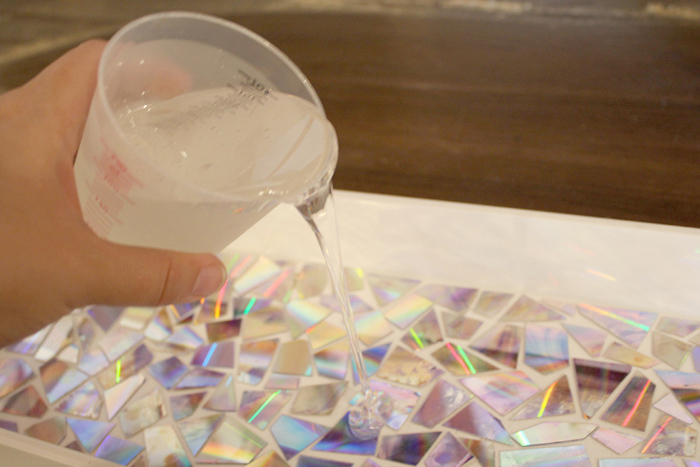 Yes, use ETI Enviro-Tex lite, it’s perfect for countertops and tabletops as well as a tray. 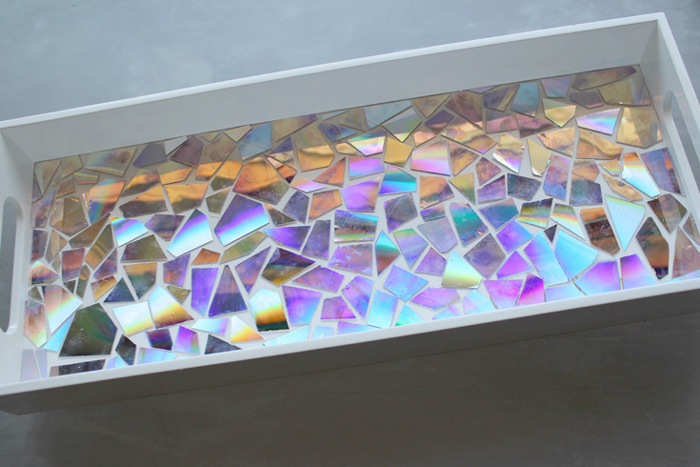 You could paint both sides using a few other colors and then break em apart as well and then theres shiny, plus colors and a beautiful mosaic blend…tah dah!!! Did you have to be careful with the hot gun, to make sure the tray didn’t melt? I’ve never used a heat gun so forgive me if that’s a silly question. Yes, heat guns get super hot, super fast. I only use it on the low setting, but don’t keep it in the same place long, just quickly pop the bubbles. Hope this helps! Can you use a hair dryer if you dont have a heat gun? 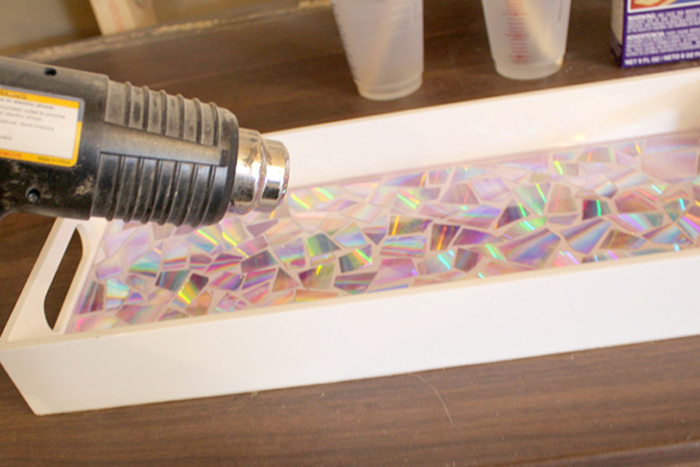 Hair dryers will blow the resin around much more than a heat gun, but a micro torch works or simply blowing gently through a straw to pop the formed bubbles. Wow. This looks like so much fun and I’d love to do something as of this sort too!